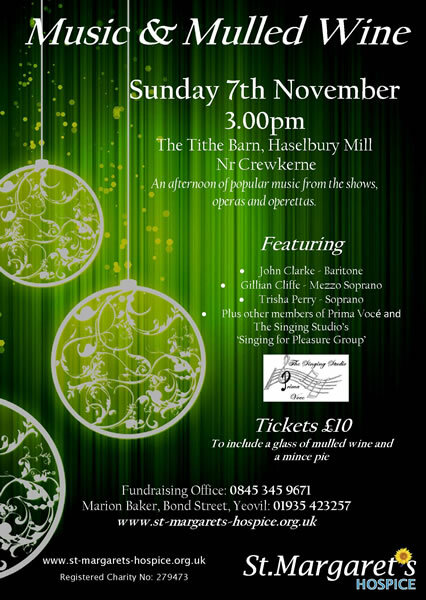 Music & Mulled Wine Concert on Sunday 7th November, 3.00pm at the Tithe Barn, Haselbury Mill Nr Crewkerne. An afternoon of popular music from the shows, operas and operettas, featuring John Clarke, Gillian Cliffe, Trisha Perry and members of Prima Voce and The Singing Schools 'Singing for Pleasure Group'. This event is in support of St Margaret's Hospice. Tickets £10 and include a glass of mulled wine and a mince pie.